Most clients sign up for seasonal plans, which begin in March/April and end in October/November. These scheduled maintenance plans ensures your landscape looks good all season. These plans are discounted when scheduled in advance. Sign up early (November-February) to ensure availability! Click the orange button for more information and to sign up! I am also available for garden maintenance as a pay-per-visit if this suits your needs better. Need a Custom Plan? Already later in the season? No worry! Maintenance plans can be signed up for at anytime of year. If you’d like a custom plan or wish to start a plan later in the season, you may request a quote. Click the button below for more information. You may request a site visit for an estimate if you’re unsure which plan is right for you. The site visit and estimate is $25+tax. However, this fee is refunded in full when a maintenance plan is scheduled. Please fill out this Estimate request form. Plants are pulled by hand or tool. Herbicide is used as a last resort and carefully applied. Stems are pruned to invigorate growth, support good health, and maintain appearance of the plant or shrub in its most natural form. Shrubs are never sheared unless a hedge or specific shape is to be maintained. Pruning is an acquired skill and should be done by a trained professional. Special pruning skills include Japanese maples and thinning out boxwoods. A hand spade is used to define garden beds. 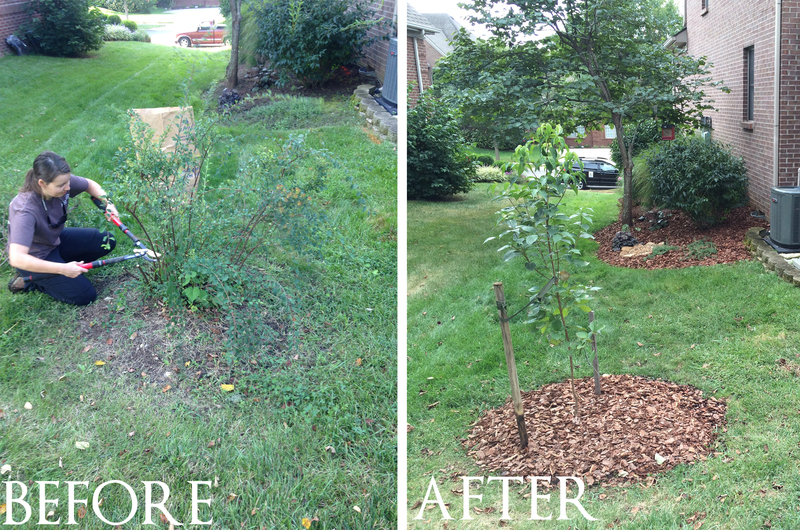 Natural hardwood mulch, pine fines or nuggets can be freshened in small areas in a maintenance visit. Pine straw makes a nice top dressing. Larger areas to mulch will be scheduled as a seperate maintenance day, not included in plan pricing. Compost can be added to garden beds, raised beds, or kitchen garden areas. Compost is sourced first locally from Seedleaf or other reputable source. Some plants need to be invigorated every few years by dividing. Plants that have outgrown their space or needing a second chance can be transplanted to a new area. All fertilizers used are natural & organic. Special fertilizing is recommended for specific plants including: vegetables, fruiting shrubs like blueberries, raspberries, blackberries. Trees, hydrangeas, holly, rhododendrons, azaleas, magnolias, boxwoods, and even lawns. Annuals can be planted in garden beds or in potted containers spring, summer, fall, and winter. Herbs planted in the kitchen garden, or colorful hanging baskets hung on the patio. Spring bulbs planted in the fall. Simple holiday decor can be added such as flags, lights, pumpkins, wreaths, ornaments, etc. This includes plantings by seed, bulb, or live plants. I can help plan and plant your vegetable garden, fertilize, water, and harvest. Prune berry shrubs and young fruit trees. Plants will be taken care of should an issue arise with a pest or disease. Some flowers will be deadheaded to encourage reblooming or to focus energy back into the plant. An organic fertilizer can be applied in the fall. This is the only fertilization the lawn needs! Seed can also be broadcasted at this time for overseeding or reseeding bare patches. Who does the garden maintenance? The owner of EARTHeim takes care of all the garden maintenance. This allows a client based relationship to be built and ensures your garden will be taken care of with the most expertise.